We have years and generations of experience caring for families, from all walks of life. Each family comes to us because they know we are leaders in our profession, dedicated to excellence in service, and have the highest integrity. William Wesley Bowerman was born on July 19, 1874 in Shiocton, Wisconsin. He was 27 years old when he arrived on April 9, 1896 in the emerging town of Munising with its 17 buildings. His first job was in the restaurant of Henry Lipshield, located on the site of the present Country Connection near the northeast corner of Superior and Maple Streets. On June 4, Mr. Bowerman became a partner in the Columbian Restaurant. On September 30, 1896, William Wesley Bowerman married Louise Euphrasine Messier. William and a relative of Shiocton opened a furniture store called the Columbian Furniture Company located where the Superior Cleaners is now. The back room served as an undertaking business. In 1897, William was taught embalming techniques by his partner. He finished formal schooling and training and graduated in 1901 with the first class of embalmers to be licensed in Michigan. In 1917, William bought out his partner and purchased the building south of the former Hayes Drug Store. A second generation came into the business at that time when Mervine “Barney” was brought in to form the Bowerman & Son Undertaking and Furniture Business. Bowerman & Son moved in 1931 to the east end of the Peoples State Bank building. In 1933 the two businesses were separated with the furniture store remaining on Superior Street and the funeral parlor was moved to Munising Avenue. In 1954, William Bowerman II and Richard D. Hallifax bought out the business of Beaulieu Funeral home. Bowerman & Hallifax formed the partnership which continued until the early death of William on April 3, 1971. Mr. Hallifax brought Richard E. Bowerman, the fourth generation into business with him. 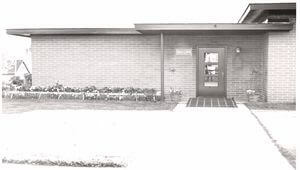 On January 1, 1979, Richard Hallifax sold out and the firm became Bowerman Funeral Home, which it remains today. In 1995, Allison Bowerman-Johnson joined her father as the fifth generation funeral director in Munising. Her brother Richard “Rick” Bowerman II joined the business in the fall of 2006. It would be remiss to not mention our dear beloved Milton “Uncle Footsie” Bowerman who worked for all five of the generations and claimed Allison was the worst of them all. Uncle Foots died on October of 1998. He is still missed today.